Bubblegum was one one of my favorite indulgences as a little kid (I could eat a roll of bubble tape day!). As ones taste changes as they grow up, I now prefer bubblegum as a color in my closet or in an accessory in my home. It is surprisingly a very versatile color-- creating both the most classic and playful of looks. And much like the confection--sometimes there is such a thing as too much of this bubblegum color. So I suggest pairing it with more neutral colors and just injecting little touches here and there. i can definitely get into this color. I'm tickled pink over this post. Love everything in it. Especially that sweet bird and the kate spade frame. Ah true love. i love the clutch...great find! i checked out her etsy site and all the little clutches were adorable. they would make a great gift--especially for myself! right up my alley...I love them all! I'm loving bubblegum color more and more each day. But as you say, little touches here and there. That dress is gorgeous, darling! i want the pink bird! this is a great color...it's pink w/an attitude. Blair, love this collection! I'd love to wear the sandals with jeans and a t-shirt along with the clutch for a summer get together. Love bubble gum color..so feminine..!! and I love every item in your post..specially the dress and the bird..to-die-for!! Oh how girly and fun this board is! Love that adorable little purse! I love this pretty colour... though I never liked bubblegum as a kid! I especially love the paper mache bird. Oh how I wish Anthropologie shipped to Australia! And that chair is gorgeous! I love it! I was just holding this sweet little pink bird today.....thinking I would have liked to take her home with me! Thank you for your sweet comment my dear! I just love that little birdie. I missed her at Anthropologie. Such a little cutie, and perfect in pink! I never thought I'd be a pink girl, but my girlie daughter brought me around. She's phasing out of the pink stage and I'm still loving it. Such pretty picks, as always! I'm seriously loving that bird. It's the perfect way to add some pink (and some cute) to my home, without making it too in-your-face girly. Not usually a big fan of pink, but I've really fallen for the pink paper-mache bird! 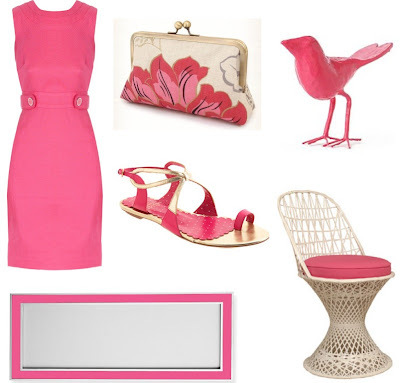 Love the pink bird and that pink dress very Jackie O.
that little clutch is adorable! The chair from Pieces and the Red Ruby Rose clutch are pieces with which I'm completely smitten, and I somehow hadn't noticed the paper-mache birds from anthro, but the lil' pink guy would make the sweetest addition to a room! Great round up. how cute is that bird!? I love the style of that dress, although that is definitely not my colour!